Traditional herbal medicinal product used for the temporary relief of sleep disturbances. Extraction solvent: Ethanol 60% v/v 96mg. Swallow 4 tablets 30-60 minutes before bedtime. If necessary, on subsequent evenings, swallow 4 additional tablets earlier during the evening. Not recommended for anyone under 18 years old. Do not take if you are allergic to any of the ingredients. Do not take if you are taking any other medicine for sleep. 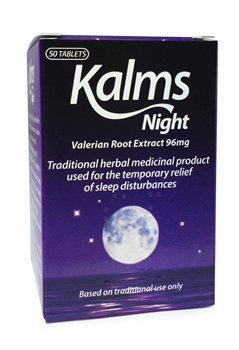 Kalms Night is not recommended for use during pregnancy or when breast-feeding.